Is There A Difference Between Power Washing vs Pressure Washing? 09 Aug Is There A Difference Between Power Washing vs Pressure Washing? Power washing and pressure washing are somewhat similar but they do differ in one key component. Power washing involves heated water along with highly pressurized water. Pressure washing, on the other hand, relies on the pressure of the water only to clean the surface of whatever you are using it on. It does not have the ability to heat or alter the temperature of the water that you are using. There are pros and cons to both types of units and depending on what you’ll need to use yours on will determine which style of washer is right for you. Pressure washing is pretty much the standard for any high powered water-based way to clean around your home. From concrete, fences, wood, brick, and even some surprising things like your car or boat. Pressure washing uses plain unheated water and forces it through the wand and nozzle at such a high pressure that it will clean off years and years of dirt, grime, and debris and make your walkway or house look brand new again. You can also add detergents and cleaners and the machine will mix it into the water as you spray. Pressure washers use up to 80% less water than your standard household water or garden hose, while also being many more times powerful. This leads to benefits for both the environment and your free time when using it to clean around your property. There are also a wide variety of attachments and nozzles that will adjust the power and pressure of the water. This way you can tailor the force and pressure that you need for each individual application that you use it for. Using not enough pressure either won’t get the job you need done, or it will take a much longer time to complete. Too much pressure could also damage or break things that you would be using it on. Check out these clips to see just how much of a difference pressure washing can make. Pressure washing isn’t just great at keeping your home and property clean but it’s also strangely mesmerizing to watch it in action. The ease at which these machines can take years of wear and tear off your property is pretty amazing. Power washing is similar to pressure washing in that the end goal is the same to use a strong water stream to clean surfaces like concrete, wood, and other different types of personal property. The main difference between the two is that power washing includes a heater to heat up the water to help break down dirt, mold, grim, and other things that build up over time. The temperature of the water helps with any stuck on debris that the hot temperature works with the water pressure to help break down the stickiness of the debris along with certain things like mold and then remove it. 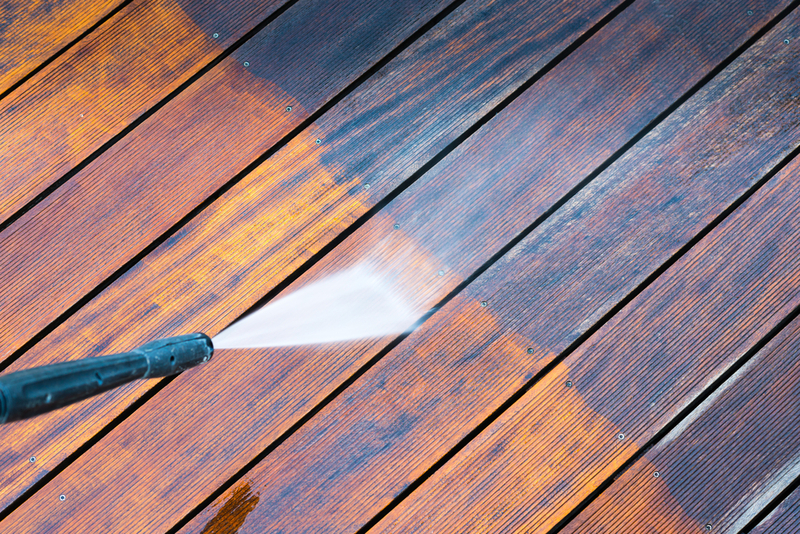 Gum, tar, glue anything sticky is a good example of when a power washer might be a better fit to truly get a deep clean. Power washing can still clean loose debris like dirt and grim but also gives you the extra benefit of the heated water to kick in and do the extra work to get the stuck on gunk removed. What Is Soft Washing And How Is Soft Washing Different From Pressure Washing? In your research on pressure and power washing you might of come across a third way of cleaning the exterior of your building that is called soft washing. Soft washing relies on eco-friendly chemical cleaning solutions to help break down the dirt, debris, and grime on whatever part of your property that you need to clean. Once you apply the cleaner and let it set in some you perform a soft rinse with plain water. So typically water at a normal pressure instead of the high and intense pressure of a pressure or power washer. What Applications Are Best For Soft Washing? You’ll want to use a soft wash on any type of surface that could be damaged from the high pressure that used with a normal pressure washer. Some siding, wood, fences, paint, plastics, and roofs can all be damaged if the wrong pressure is used. It’s best to consult with the manufacturer of the item you are planning to wash to see what they recommend. There are many different chemical agents for a variety of soft washing types out there that you can use and if done correctly soft washing can do just a good as a job as any other cleaning methods. With any tool you use in your lifetime, sometimes it’s good to have ones that will work in a variety of situations and have multiple uses. The same is true for pressure washers. If you purchase on that has control options on the amount of pressure used, then it is possible that you can use a pressure washer to soft wash. Just make sure after consulting your owner’s manual that your unit does in fact let you fully control the amount of pressure either through accessories or settings. An extra bonus to any unit is also if it gives you the option to turn on or off a heating element for the water. Those units give you the ability to have both a pressure and power washer at the same time. There are numerous types, styles, and price points out there for power washing equipment. From small units that are best for dirt and debris in backyards and on concrete to large industry units for commercial buildings or to start your own power washing business. Many residential units for the average homeowner range from $100-200 and can be used over and over again to keep things clean. For some applications like concrete, driveways, and second stories you may need some added accessories like a surface cleaner attachment or extension pole or rod.